You must be a member of the Berlin Spontaneous Activity Group to attend this activity. Would you like to join this group? This will be third boat event in Protected content the plan is continue every Wednesday until further notice. We will continue to meet up on Wednesday's during the winter months & will move inside the boat lounge where there is a cosy fire & background music etc. The boat itself is permanently moored and covered! 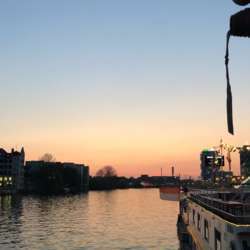 Set on the Spree, the ship Eastern Comfortis the perfect place to mingle with people from all over the world – and enjoy the friendly ambience for which the boat is famous. ‘The Boat Party’ is a regular get together every Wednesday, starting at 7.00pm. It’s a relaxed evening and an international, mixed and open crowd. Newcomers can look forward to meeting and connecting with expats and locals alike. This is what the event is about. Drop in, enjoy the music and the company. Some nights there is an external DJ other nights is our own home DJ and Bartender. For information the FL owner will charge 1 Euro per person for the disc jockey activity.